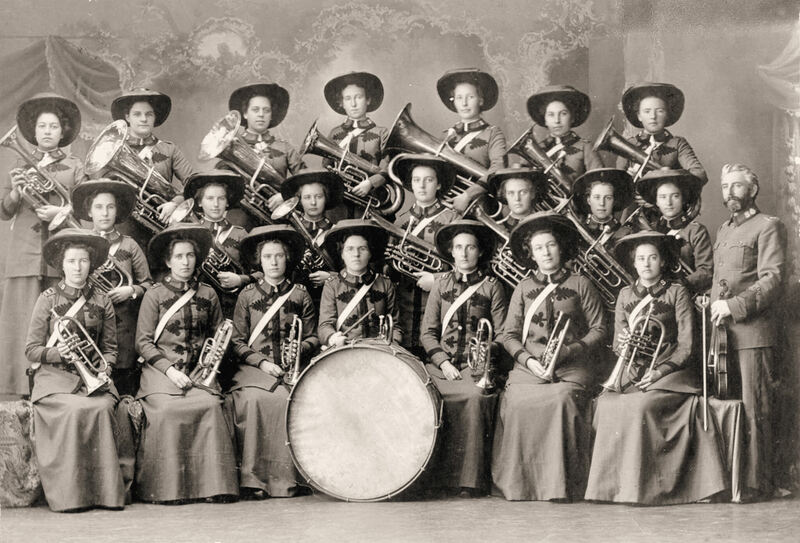 If one were to read various articles or histories of brass bands or view photos from a period from 1900-1950’s, they would notice an almost total lack of material relating to women playing brass instruments. This is not to say that women were not involved in brass banding with the many women’s’ auxiliaries supporting bands. However, when women did play brass instruments it was reported very differently to male brass bands. It did not help matters that some articles from newspapers were patronising in tone and that female brass bands, when they were formed, were treated as a novelty – until they started playing! It was a different time, and in the period from 1900 to the 1950’s society was in almost constant upheaval with two world wars and the Great Depression to contend with. However, people craved things that were familiar to them so in some cases where male brass bands were not available, a female brass band was formed. 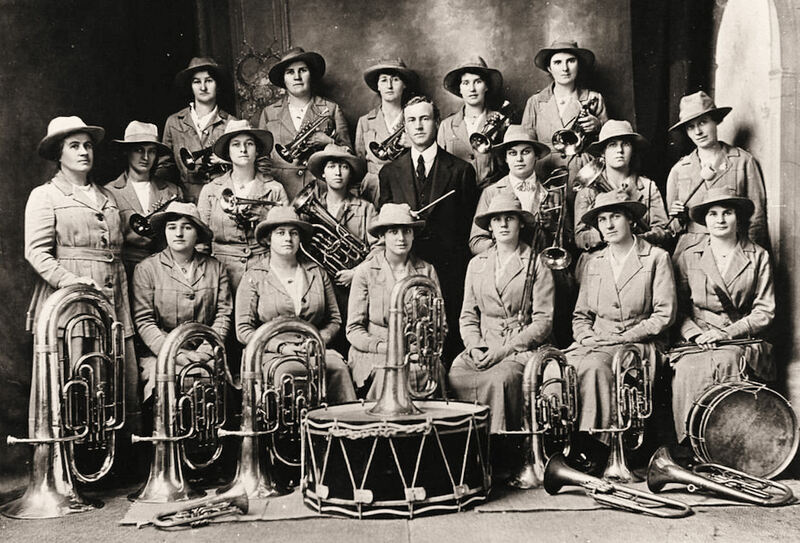 The Salvation Army was at the forefront of female brass bands but even their bands were treated as a novelty. What is evident from research is that there were pockets where female brass bands were welcomed, but in other quarters attitudes were hard to shake. This is an aspect of Australian band history that is probably not well known, however, it is important to recognize the fact that while female brass bands were rare, they certainly made their mark and paved the way for more females to join bands in the latter half of the last century. The story here will cover some of the more notable female brass bands that were formed, and some personalities. Yes, there was some underlying sexism, and this will be touched on – we wonder at these attitudes today. These historical pictures and articles tell an amazing story of life and from this we can see the achievements of female band musicians. Unfortunately, there appears to be no definitive list of female brass bands in Australia. However, due to the rarity of female brass bands, others have attempted to create a listing and the list by Gavin Holman has included the more notable Australian female bands (Holman, 2018). Hopefully in the near future a more substantial list will be produced. The Salvation Army have always been well-known for the quality and musical standard of their brass bands, and this reputation has stretched back for many decades. So it was near the start of the 1900’s that the Salvation Army, having run male brass bands for many years, started a female brass band and it is from this decision that the Daily Telegraph publishes an article in 1905 with a patronising headline (“AN AMAZON BRASS BAND.,” 1905). This is but one early example where the formation of a female brass band is treated as a novelty, despite being formed by the Salvation Army. As can be read in the article, part of it focuses on the uniforms the members will be wearing, but nothing on the women playing instruments. Some curiosity has been aroused by the advent in Broken Hill of a ladies’ brass band having for its name “The Austral” and being comprised of 21 lady performers dressed in Salvation Army costume. As these bandswomen took the tram to the southern suburb last night, many observers speculated on what their bright faces must suffer when puffed up at the end of a bass instrument or when trying to sustain a long passage on the cornet. (“THE AUSTRAL BRASS BAND.,” 1906). Very much an article of two halves and the language is varied. Unfortunately, the perception that females should not be playing brass instruments due to the aesthetics of playing is one that is published occasionally, as will be seen in a later article. As can be seen by this list, South Australia had an amount of female brass bands during this time and as Holman has written that this was mainly due to bandsmen enlisting in the armed services for WWI, and the women stepped forward to form bands (Holman, 2018). Certainly this was the case for the bands from the towns of Burra and Clare (Sara, 2014). The Streaky Bay Ladies’ Brass Band was formed in 1919 and built themselves up over many years (“A LADIES’ BRASS BAND.,” 1919). The Largs Orphanage Girls’ Brass Band is interesting as it was obviously formed in the same manner as other orphanage band, although by looking at the photo in their article they included woodwinds as well (“WEEK’S PICTURES,” 1923). The playing from this orphanage band was well regarded and appreciated (“THE BRIGHTON CONTINENTAL.,” 1922). The photos below attest to the presentation and demeanour of these ensembles. later than the bands in South Australia, although obviously the Salvation Army female band is an exception. 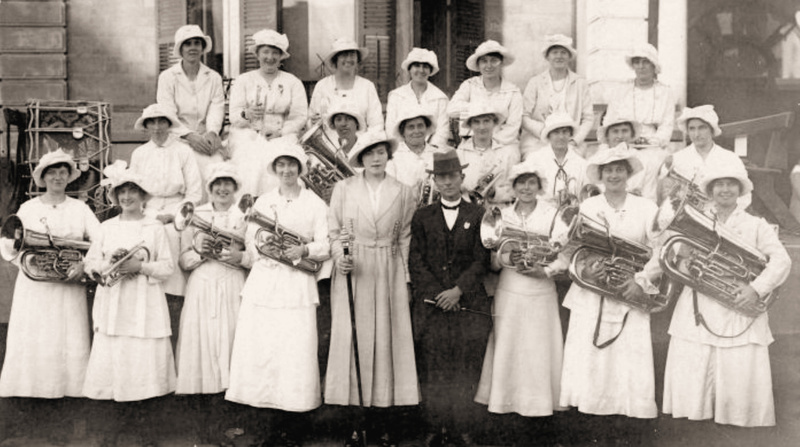 The Silver City Ladies’ Brass Band was formed in Broken Hill in 1940 and the Brisbane Ladies band was formed around the same time (“Concert To Mark Formation Of Women’s Brass Band In City,” 1940; Holman, 2018). On a side note, it is the idea of a female band forming in Brisbane that brought out another bout of sexist (and instrumentalist?) behaviour in the media with the publication of a letter in a local newspaper in 1934 (“That Ladies’ Band,” 1934). As can be seen by the article, the language says it all and mirrors that of the writing from 1906 – old attitudes don’t seem to go away. In later years, as mentioned in a previous blog post, a girls’ brass band was started at Balranald High School and a picture of them is in this article from 1949 (“GIRLS and a BRASS BAND,” 1949). The story of the Sydney Ladies’ Brass band will be brought up later in this post as it has a special story which is interlinked with a story from Victoria. Victoria has long been regarded as a centre of bands however when it came to female bands there was a distinct lack of progression. Through research it appears that the first real proposal for starting a female brass band appeared in 1937, which is late compared to South Australia (“LADIES’ BAND PROPOSED,” 1937). One could perhaps view this as a battle against bandsmen conservatism. However, in amongst this came the remarkable story of Hilda Tansey who eventually became Australia’s first recognised female band conductor (Bound for Australia, 2014). The cited blog post outlines much of Hilda’s life in brass banding. In summary, Hilda learnt brass from her father and travelled with her father around Victoria (Bound for Australia, 2014). Her father (who was a noted bandsman in his own right) eventually became the bandmaster of the Traralgon Brass Band and it is here were we first see a picture of Hilda with her Tenor Horn sitting in amongst the other band members (see below) (Bound for Australia, 2014). This was obviously an extreme rarity in Victorian banding to have a young female playing brass in a proper brass band. Yet soon after this photo was taken, Hilda is listed as a member of the Traralgon brass quartet that contested the South Street competition in 1917 (“Bandsmen to Compete at A.N.A Competitions.,” 1917). Hilda’s career in bands progressed from this time. The Sydney Ladies’ band deserves special mention for being the most well-known of all female brass bands in Australia, and even more so after Hilda was appointed conductor in 1934 (Bound for Australia, 2014; Holman, 2018). Again, much has been written about the Sydney Ladies’ Band by Holman and the Bound for Australia blog post, so this is a summary of the life of the band. 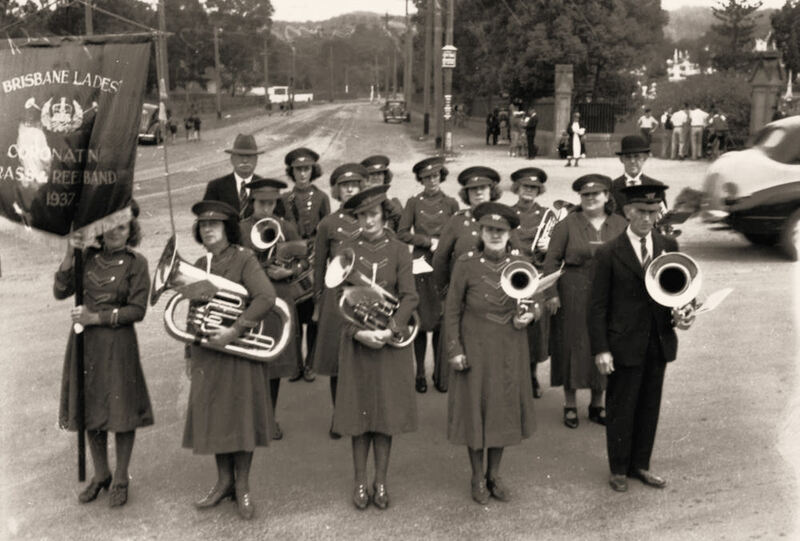 The band was formed in 1930 but had early financial difficulties however Hilda and other ladies took it over in 1934 and had the debt repaid through member contributions, paid engagements and social functions (Holman, 2018). The band was quite busy in Sydney and participated in numerous parades and other events (Bound for Australia, 2014). In 1936 the band broke even more ground by becoming the first female brass band to enter the City of Sydney Interstate Band Contest in the Open D Grade section against eight male brass bands (“WOMEN’S BAND,” 1936). During the years of WW2 the band was involved in entertaining troops at various camps, however, later in the war years “the R.S.L. refused to let the band march on ANZAC Day 1945, and this was a contributing factor to the members’ decision to disband.” (Holman, 2018, p. 73). As for Hilda Tansey, she kept up with her brass band activities and is seen in a picture from the 1960’s playing with the Randwick District Town Band (Bound for Australia, 2015). 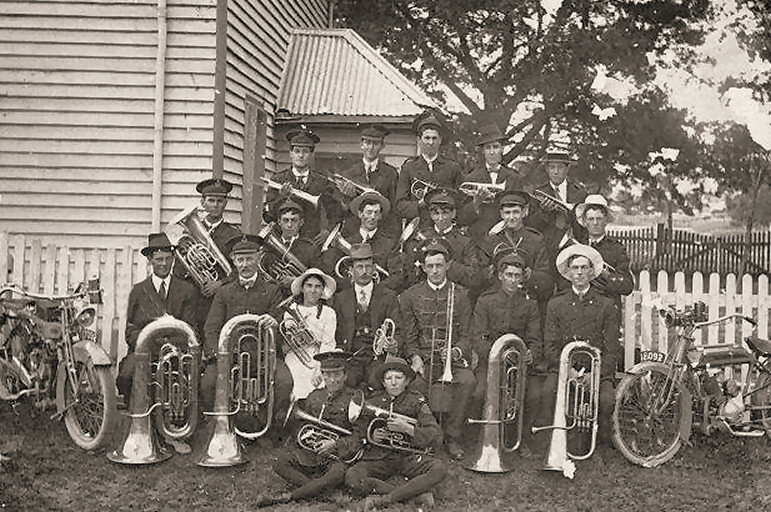 Against some odds there were female brass bands in Australia and these bands, for the brief time they were in existence, made their mark and gained favourable reputations. It is unfortunate these bands did not survive; however, it is shown that their legacy lives on. Who is to say if they were ahead of their time as some bands were started out of a social necessity, whereas other bands were started as recreation and training for women and girls. We can look back at those times and wonder what it was like and thankfully there are the articles and photos that allow us to do that. We can also look back and wonder at the attitudes and language from some quarters where they felt that women should not play brass instruments due to aesthetics! Nevertheless, where there was a will, there was a way as Hilda Tansey clearly demonstrated with the Sydney Ladies’ Band. I hope that the history of female brass bands becomes better known in Australia instead of the patchwork of little histories. In amongst all the other histories of banding in this country, this is one of the special stories. The Army in Australia used to have separate for females – WRAACs as they were called. Therfore the bands that were formed in those units we all female bands – my apologies if you already know this. Thanks Pau. I wasn’t specifically focusing on WRAAC’s bands but I am aware that they may have existed – I’m not sure they showed up on any Trove searches. The closest I could find to a female brass band connected to the AIF was a Bugle band formed out of a uniform factory in Melbourne. I probably should’ve mentioned it but it wasn’t strictly a full brass band – just bugles.